All are very welcome to join us for the last screening and discussion session of this term, which will take place on the 30th of March, 5-7pm, in Jarman 7. We will be showing Frances’ suggestion: The Student of Prague (1913, Stellan Rye, 85mins). The Student of Prague is a silent, German film starring Paul Wegener as the titular character. The film has had a few remakes (and re-cuts), including ones in 1926 and 1935, and different versions of the original have subsequently been released. One 2004 DVD release, for example, has a running time of approximately 50 minutes. As will be explained by the opening of the version screened today, details gathered from press releases and exhibitions notes reveal that the film should be over 80 minutes long. Today’s film has been restored by Filmmuseum München and is a more complete version of the film. 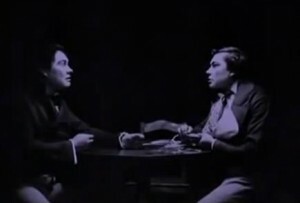 This cut of the film thus contains expanded scenes which allow for the development of some of the supporting characters, and in particular that of the ‘wandering girl’. Like many of the other films screened in the season, the double figure in The Student of Prague is an evil, trouble-making doppelganger. Balduin’s reflection stalks his original owner and sabotages his efforts to seduce the countess. As we have discussed previously in relation to this theme, it seems impossible for the double and the original figure to co-exist in these stories. The narrative of The Student of Prague explores the intolerability of this situation but with an additional twist: by removing Balduin’s reflection, Scapinelli effectively removes an aspect of Balduin directly – his soul. This aspect is confirmed by the film’s melodramatic ending which is reminiscent of Simon’s efforts to deal with an unwanted doppelganger in The Double (2013) screened a few weeks ago. 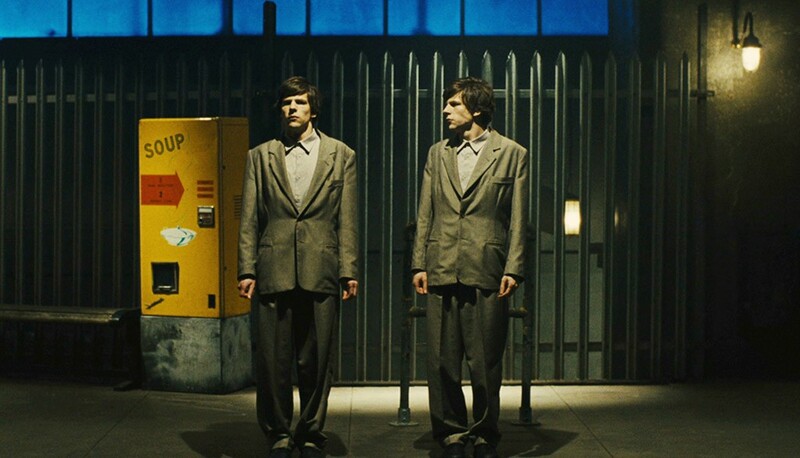 The filmic representation of the double is a topic we can discuss after the screening. Do join us to watch an early example of the doppelganger theme on-screen, and see why The Student of Prague proved so influential for Rank’s work. Rank, O. 1971. The Double: A Psychoanalytic Study. Chapel Hill: The University of North Carolina Press. A quick reminder about an exciting upcoming event. Kathleen Loock will be talking to us about Sound remakes on Wednesday the 1st of April, 2-4pm, KSR4. All are very welcome to join us for our next screening and discussion session, which will take place on the 23rd of March, 5-7pm, in Jarman 7. 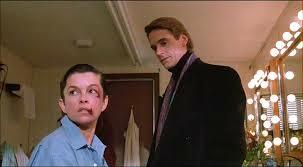 We will be showing Kat’s choice: Dead Ringers (1988, David Cronenberg, 116 mins). 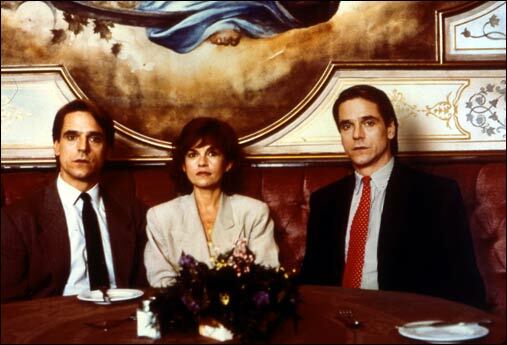 There comes the inevitable point in Dead Ringers (1988), where Claire meets both Beverly and Elliot together for the first time. Having her fears realised that while she thought she was involved in a sexual relationship with one, she had been unwittingly duped into sexual intimacy with both, she is horrified by their presence. This scene is pivotal as in Claire’s repulsion the audience realises fully the true horror of their behaviour. Despite the spectator being privileged with the knowledge that Elliot and Beverly are identical twins and have seen both together on screen previously, the meeting with Claire unveils the creeping extent of the uncanny nature of their existence. It’s as if we are meeting ‘the double’ for the first time. But who here is the double, Beverly or Elliot, or both? The film is a meditation on primal fears towards twins. Beverly and Elliot (known as Bev and Elli, very feminine names and both played by Jeremy Irons) Mantle are both celebrated gynaecologists who share everything; knowledge, reputation, work and women. When a famous actress, Claire Niveau (Genevieve Bujold) seeks treatment from them, Elli, the more outgoing of the twins, begins a relationship with her and subsequently encourages Bev to continue the liaison by pretending to be Elli. Claire’s presence in their lives is a catalyst for an excessive downward spiral for Bev and Elli as sexual depravity and drug use threaten not only their work but their existence. The doubling in Dead Ringers is a variation on the concept of the double. The explicit difference with the film is that the two act as if one entity and wish to remain so. The horrifying nature of doubling is only disclosed through the character of Claire. It is this introduction of reality and “normality” of love and relationships that is the threat to their existence in endeavouring to separate them into single units. It’s an uneasy watch as Cronenberg deftly crafts and builds on the creeping horror scene by scene. In an interview, Jeremy Irons explained in order to remember which twin he was playing, he played one by walking on the balls of his feet and the other by walking on his heels. Creeping indeed. Or just creepy? Do join us, if you can, and please note that due to the film’s length we will be starting promptly. All are very welcome to join us for our next screening and discussion session, which will take place on the 9th of March, 5-7pm, in Jarman 7. 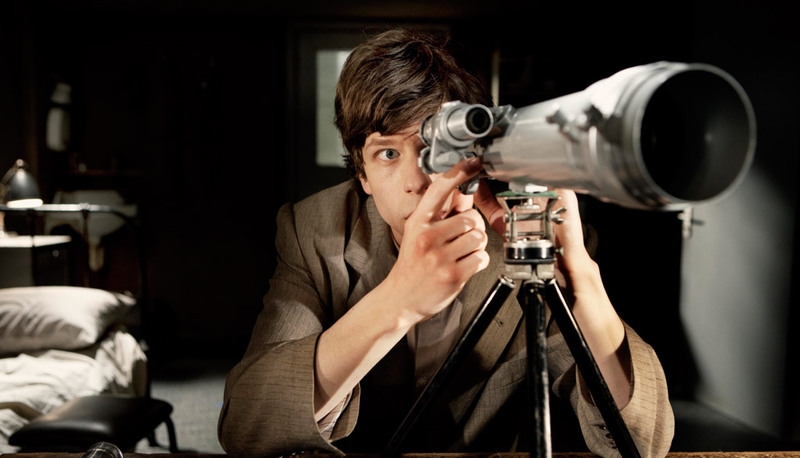 We will be showing Frances’ choice: The Double (2013, Richard Ayoade, 93 mins). There is a moment at the beginning of Fyodor Dostoyevsky’s novella The Double when the main protagonist, Yakov Petrovitch Golyadkin, is first waking up in the morning and it is observed: ‘For two minutes, however, [Golyadkin] lay in his bed without moving, as though he were not yet quite certain whether he were awake or still asleep, whether all that was going on around him were real and actual, or the continuation of his confused dreams.’ This description imaginatively captures the experience of watching the 2013 film of the same name, directed by Richard Ayoade and starring Jesse Eisenberg. Just like Golyadkin’s reflections in the Russian short story, we as viewers of the film are left wondering at the movie’s conclusion whether what we have watched has a logical explanation, or whether it is the product of the protagonist’s ‘confused dreams.’ The film is an adaptation of Dostoyevsky’s work but our main protagonist is now Simon James. Simon lives a dull and monotonous life, spending most of his waking moments working in a dreary office, where he is ignored and shunned by his colleagues. The rest of his time is spent unsuccessfully wooing a work colleague and neighbour Hannah, who he watches in her apartment through a telescope when at home. Simon’s life changes dramatically, however, when a new employee appears at work and is the exact physical double of Simon. This doppelgänger – named James Simon – is physically identical to Simon in every way but the former’s life could not be more different. Where Simon is reserved and his work efforts remain unacknowledged by his peers, James is confident, successful and popular with everyone. James even manages to seduce Hannah. Simon’s bewilderment at the situation is heightened by the fact that no one else sees James as a double: only Simon can perceive the uncanny resemblance between the two men. Simon soon realises that James’s presence in his life is intolerable and the story focuses on Simon’s attempts to resolve the situation. It is for these reasons that The Double operates quite differently from some the other films screened in this season on the double. The film features an actual doppelgänger whose presence is unexplained, unlike some of the other films where this doubling is explained, for example, through mistaken identity or sibling similarities. Yet the melodrama of the film stems, like the other stories shown, from the double character. In The Double it is James’s intrusion into Simon’s life which illuminates themes such as unrequited love, dysfunctional family units, a crisis of the self, the pain of loss and attempted suicide, and entrapment within an unfulfilling and mundane life. Despite these highly melodramatic themes, the tone of the film is difficult to articulate. The film’s opening demonstrates this well. We are introduced to Simon on a drab looking train on his way to work. There are few other characters occupying the carriage where Simon sits silently, and yet an intimidating stranger demands Simon move. Simon quietly and nervously acquiesces to the unreasonable demand. Similarly, moments later Simon attempts to leave the train but is constantly stopped by another passenger loading packages onto the carriage who ignores Simon’s need to alight. The scene successfully encapsulates Simon’s tragic existence and it is frustrating, saddening and uncomfortable to watch. Yet the scene is also darkly humorous, as the ridiculousness of the situation becomes comic. It is the complexity of the film’s tone and the ambiguity of its narrative which makes The Double a compelling viewing experience and challenges the viewer to make sense of these strange and chaotic interactions. Should the events portrayed in The Double ultimately be interpreted as ‘real and actual’, or are they the product of ‘confused dreams’? It will be interesting to see what conclusions we draw in our discussion after the film.